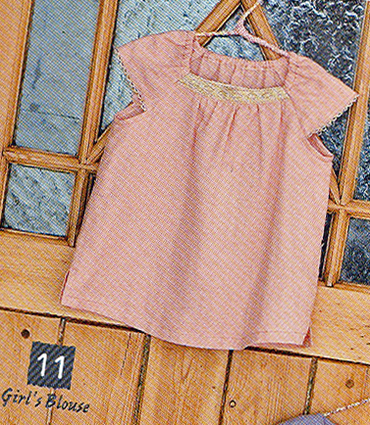 I finally dug into this lovely book (pictured on the right hand side), the mum & daughter tops & skirts just keep pulling at me. Understanding the pattern and how the book is set up took a bit of getting used to. I was very surprised by how the patterns are all laid on top of each other, it was very confusing. I was almost tempted to get my dh to take the book to his work place so he could have one his Japanese Students figure it out for me. But I didn't and forged ahead. It wasn't so bad after all. I started with making the pink top on the cover for my girls. It was just too pretty to pass up. Since this was my first Japanese pattern and not being too sure (or confident) as to how things would turn out, I pulled out my vintage sheets to "practice" on. I am so glad that I did because the blouses are so pretty and gave new life to the delicate, yellow-flowered sheets of old. 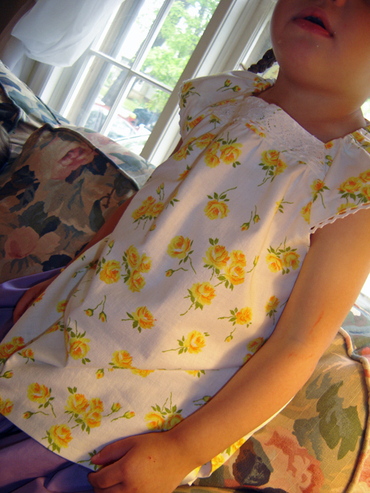 It went rather well and I was happily surprised at how simplistic the pattern pieces themselves were, once traced. Basically once you get past the road map, things were fairly straight forward. Nothing tops off this blouse like a nice set of braids. My wee girls ask me every morning to "have hair like Laura" (Ingalls) from Little House on the Prairie and I, their "ma" happily oblige. 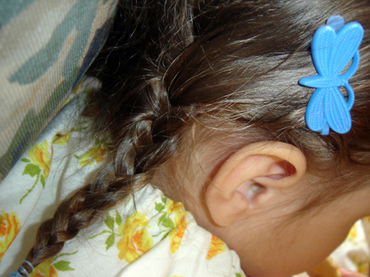 Oh and the other thing they love, love, love is their butterfly barrettes, can't forget about those. Well I'm hoping to get a few outdoor things done this weekend as it has rained all week long. I'll also be trying to sneak some more Japanese sewing goodness in as well. Have a lovely weekend everyone. 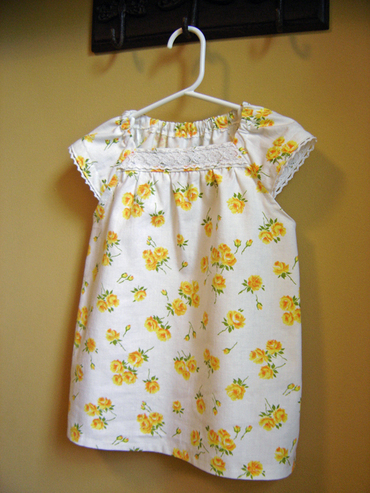 the dresses are adorable - great pattern and perfect fabric to highlight the details. and those braids?!?! TOO CUTE! really well done, looking forward to seeing what's next!